Heute morgen las ich mit Erstaunen den Meedia-Artikel zur Mogelpackung von Jung von Matt mit der sie einen goldenen Werbe-Löwen in Cannes gewonnen haben. Da ich das Thema Stolpersteine a) viel zu wichtig finde um es zur Eigenpromotion zurverwenden, und ich mir b) immer wieder (bislang allerdings ohne greifbares Ergebnis) dazu Gedanken gemacht habe wie ich mit meinen Skills im Bereich Mobile Internet, Apps und EBooks helfen kann, stolpersteine.com zu unterstützen, habe ich mir das ganze mal genauer angesehen. Was ich sah ging IMHO noch weit über das hinaus, was Meedia berichtet. So sind meiner Meinung nach auch die iPhone App und die Poster im Presentation Board Fake. – Die im Video kurz zu sehende App der Landeszentrale stimmt weder im Look & Feel noch in der Funktionalität (es gibt keine Bilder und Biographien in der App, es wird auf die Website verlinkt). 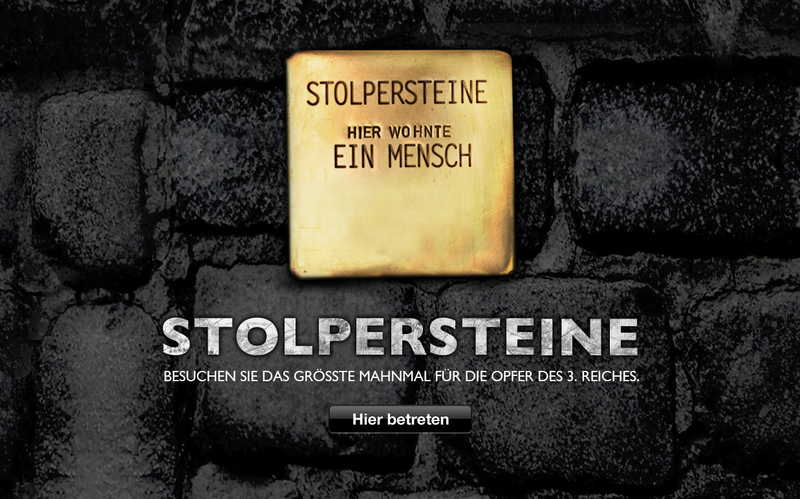 Eine andere Stolperstein App konnte ich im App Store nicht finden. – Das Foto mit dem Poster zeigt offensichtlich einen Kartenausschnitt mit einem Pfeil “Sie sind hier”, der auf die Kreuzung Neuer Pferdemarkt / Feldstr. zeigt. Soweit ich weiss, gibt es an dieser Kreuzung keinen derartigen Aufsteller. – Ich arbeite im Mittelweg, und bewege mich daher praktisch täglich in einem der Viertel mit einer der größten Stolpersteindichten in Hamburg. Nie habe ich auch nur eines der angeblichen Poster in freier Wildbahn gesehen. – Der Claim “Besuchen sie das größte Mahnmal für die Opfer des 3. Reiches” ist IMHO einfach nur widerlich. Auch die relativierung im Video: “im Internet” ist für mich ein Hohn. Schon einmal auf http://www.yadvashem.org gewesen? – Da ich mir die Nutzungsbedingungen für die Biographien auf stolpersteine-hamburg.de schon einmal genauer angesehen hatte, war ich verwundert, dass ich beim zufälligen Herumclicken einen Biographie fand die komplett (inklusive Bild) von dort übernommen wurde. All das hat mich veranlasst, Mails mit Fragen an Gunter Demnig und die Landeszentrale für politische Bildung zu schreiben. Damit sich alle Interessierten selbst ein Bild machen können, dokumentiere ich hier meine Fragen. – Kennen sie die Jung von Matt Kampagne resp. stolpersteine-online.com und haben sie mit Jung von Matt zusammengearbeitet? – Wenn nein, was halten sie davon, dass Jung von Matt im Film suggeriert, dass die durch sie finanzierte iPad-App (sic: sollte iPhone App heissen) im Rahmen der Kampagne entstanden sei, und im Presentation Board eine iPhone App mit andere Funktionalität und UI zeigt. 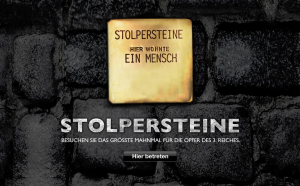 – Halten sie es sinnvoll, wenn neben stolpersteine.com und stolpersteine-hamburg.de mit stolpersteine-online.com eine weitere Website entsteht? – Haben sie davon Kenntnis, das unter Copyright stehende Biographien im Volltext von stolpersteine-hamburg.de übernommen werden? z.B. 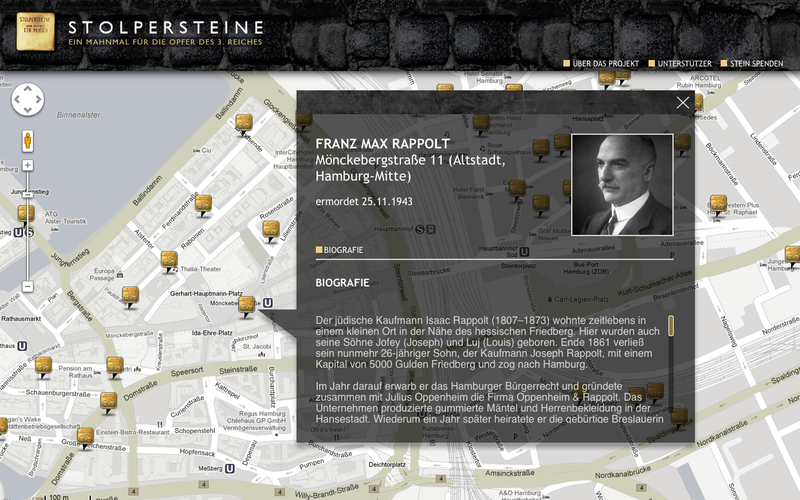 die Biographie von Franz Max Rappolt http://www.stolpersteine-hamburg.de/index.php?MAIN_ID=7&BIO_ID=1761. Wissen sie ob hierfür die Genehmigung der Autoren eingeholt wurde? Update: Die Landeszentrale für pol. Bildung hat mir geantwortet. Sie ist gelinde gesagt sehr überrascht. Anscheinend gab u.a keine Genehmigung für die Bilder und die Biographien. Das dürfte der Grund dafür sein, dass die aktuelle Website stolpersteine-online.com in der Regel keine Bilder und Biographien zeigt. Natürlich könnte Jung von Matt auch mit den einzelnen Autoren die Rechte geklärt haben. Aber dann glaube ich lieber an den Weihnachtsmann. – Wenn nein, was halten sie davon, dass Jung von Matt ihren Namen als Auftraggeber in der Kampagne angibt? – Wenn ja, warum wurde dann nicht einfach stolpersteine.com um die entsprechende Funktionalität erweitert? A new look and feel that’s cleaner, faster, and nicer to look at. The ability to +1 a feed item (replacing “Like”), with an option to then share it with your circles on Google+ (replacing “Share” and “Share with Note”). Integrating with Google+ also helps us streamline Reader overall. So starting today we’ll be turning off friending, following, shared items and comments in favor of similar Google+ functionality. Since i’m a heavy user especially of sharing items i was very eager what this means to me. Share via Reeder from my iPad, iPhone etc. Since i’m doing nearly all my reading from the iPad basically nothing has changed for me. @googlereader What about a GR "Classic" Theme (opt-in) with Sharing etc. Running both Themes in parallel (Two tabs) right now. Works. All this makes it clear that there is no technical reason for not having the old and the new version of Google Reader available in parallel. So Google, act up to the Google Reader Petition and make the “Classic” Version available as a configuration option / theme. You can even keep the new look and make the +1 Version the default theme. You can even turn it into an easter egg, e.g. embed the functionality with a display:none style (Greasemonkey etc) here i come. Just don’t retire the inofficial API. If this is not going to happen, resp. there are a couple of plan Bs, including switching to starring instead of sharing,building a greasemonkey script that fuses the share functionality from the bookmarklet into the page, using a customized SendTo in conjunction with PressThis on a WP blog (would right now not work with Reeder) etc. Just bought Reeder for the Mac to be able to easily share from the Desktop again. We recognize, however, that some of you may feel like the product is no longer for you. Right now, i’m actively thinking about alternative solutions. And i’m not the only one. Not surprisingly the one’s that are complaining are the most avid users. And what they are telling is mostly the same. Although there are many other services out there that promise to bubble up relevant content based on my interests, the best product I’ve used to date was the human curation of my Google Reader friends. Not only did my group consistently share the top tech news I’d want to read, they also share those oddball but interesting stories from outside of tech, including humorous cartoons, popular videos, space and science news, parenting tips and other news completely unrelated to tech, but still compelling. For one thing, Reader is only sort of a social network. In many senses it’s ananti-social network. Not in the sense that people in Reader are anti-social so much as the point is to harbor a small enclave of carefully selected people and create a safe-haven of sorts where that “carefully constructed human curated” list of shares and insights can flourish. In Reader, you don’t go after as many friends as possible. You certainly don’t see anyone from high school. Nobody shares photos of their kids. The discussions that do blossom are almost always very smart and focused. It’s the internet if the world were a more prefect place. I like that the primary verb of gReader is “share” – but not about you; about content that’s meaningful to you. I like that I have to click on a specific tab in order to get the little window that allows me to post only about myself. This brings me to the reason why i’m upset about the changes. The title of the post already says why. 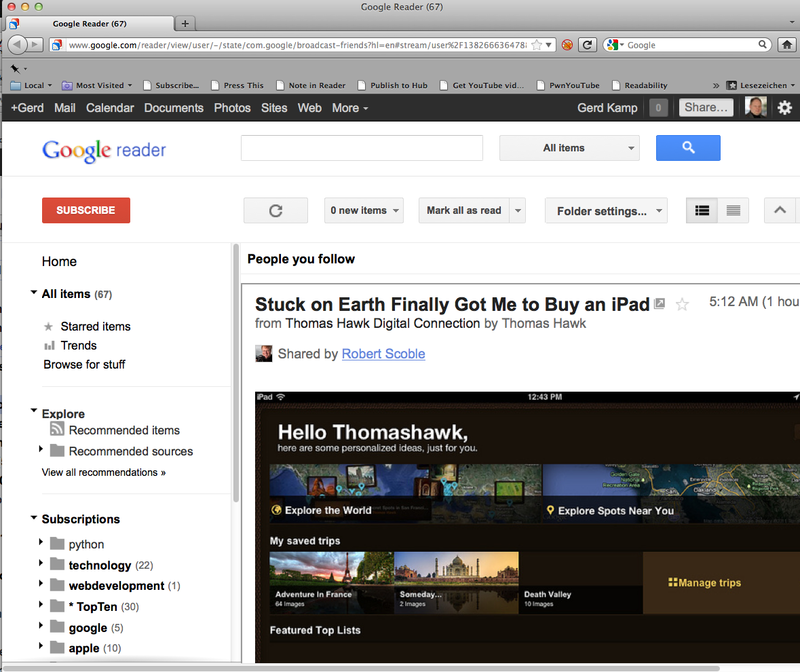 For me Google reader is THE essential tool for reading news, as well as a long running experiment in human curation. But from the sending side, not the receiving. I’m a long time RSS-Feed reader and switched to Google Reader because i was able to access my feeds from multiple computers without losing sync of the read items. I then discovered the productivity gains of the keyboard shortcuts and the shared item feed. At that point i decided to share all the posts that i found interesting via Shift-S. Interesting in an impartial sense, e.g. providing useful or meaningful information, looking at some topic from an interesting / different angle etc. While the primary impetus for doing so was being able to access these items more easily and being able to archive them via another client, early on i also decided to make all shares public to everybody. First and foremost because i wanted to have as little as possible overhead while reading. But also out of curiosity if somebody would discover this “human curated” feed and would find it useful. Over the time quite a number of my colleagues found it (ok, i stopped sending separate emails about interested stuff and directed them at my sgared item feed). But after Google started it’S recommendation engine, quite a number of Google Reader users are following my feed and there is a small but dedicated number of subscribers via other feed readers (as my Logfile shows).All in all im absolutely sure that my shared item feed has more readers than this blog. It should be clear now that for me sharing on Google Reader is about curation or if you prefer another, more humble term, about filtering. It is not about liking, agreeing or recommending. Hence i always struggled with the german translation of Sharin within Google Reader: “Empfehlen”, which backtranslates to “Recommend”. Your +1’s appear here. +1 the things around the web you like, agree with, or want to recommend to others. And here we are at the heart of the problem. No: I neither like, agrre with or recommend these things. I simply share them. Some of you might think i’m nitpicking. May be i am. But my background in Knowledge Representtation and AI as well as my common sense want to separate my social “human curation” activities, from my recommendations, likes, opinions and emotions. These latter social activities are right now mostly happening on this blog and on Twitter (both for opionion andemotion) as well as my pinboard.in bookmark account (basically recommendations of technical things). Recently switched from delicious to pinboard.in for basically the same reasons. I thought the changes especially in the T & C introduced by the new ownership were ridiculous and switched to another service where i’m more in control. But i habd plenty of time doing so. Yahoo announced that they were retiring delicious last December, and the switch to the new t&C was enforced only recently. Google instead is giving only one week advance notice. This is definitely too short to come up with a soltuion for the third party providers that are using the inofficial Google Reader API. The one i care most about is Reeder, because it allows me to read (and easily share) on my iPad. Hopefully it will at least will work in reading mode after the changes. @googlereader Do you think that Reeder and other apps can adapt in 1week? It will take that long in review. Ok, you don't care. Even if an official API would be announced today and implemented by Silvio Rizzi in an instant, it would take a weeks time until the new app in the app store. So opefully Google is going to keep the inofficial API around , maybe even announce an official one. P.S: This is the first post in which i’m using Blackbird Pie for embedding Tweets. Works like a charm. Highly recommended.